George W. Bush was the 43rd President of the United States. He was sworn into office on January 20, 2001, re-elected on November 2, 2004, and sworn in for a second term on January 20, 2005. 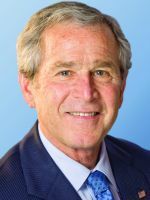 Prior to his Presidency, President Bush served for 6 years as the 46th Governor of the State of Texas, where he earned a reputation for bipartisanship and as a compassionate conservative who shaped public policy based on the principles of limited government, personal responsibility, strong families, and local control. LA District 07 - Runoff - Dec 04, 2004 R Charles W. Boustany, Jr.